Looking for the perfect vacation destination? 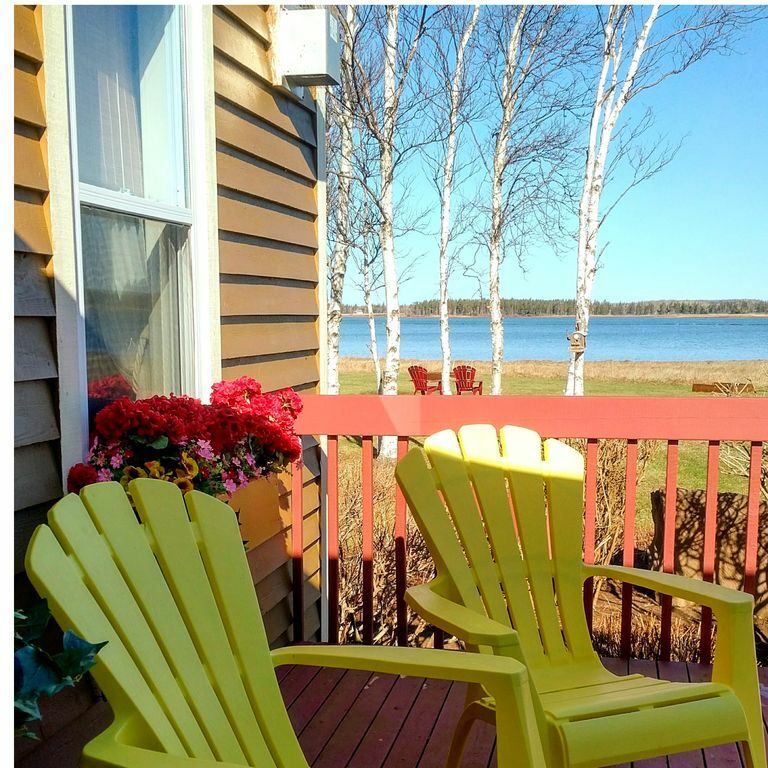 Bellmora Beach House is located just a short scenic drive East of Charlottetown, (the capital of PEI) on PEI’S Points East Coastal Drive. Have fun exploring the many local beaches, restaurants, golf courses, and of course, enjoy the some of the freshest sea food around. The Points East Coastal Drive has more than 50 amazing beaches with the warmest saltwater North of the Carolinas. We are also less than an hours scenic drive from Cavendish, Cavendish Beach and Ann of Green Gables. Your vacation experience begins as you drive down the tree-lined red dirt lane where at the end you'll find the beach house surrounded by beautiful birch trees, expansive lawns, mature gardens, and the red sand beach at your doorstep. Just steps from the beach house you'll find the natural calm red sand beach great for families and children. Enjoy long beach walks, take a dip in the refreshing salt water, collect seashells, build sand castles, and at low tide try your hand at clam digging. Our beach is always changing and from time to time depending on the time of year, tides and currents you will find seaweed on the beach. We don't remove the seaweed as it helps with erosion and also gives the marine life a place to live and hide from predators. On a rare occasion, we do have jellyfish visit our beach if the conditions are right. There are two types on our shores, one will give you a mild sting. If you rub sand on the spot the sensation will subside. Both types are non life-threatening. Lastly, the sand actually shifts on an inconstant basis due to the currents and tides. Seawater rises continuously reworking and shaping the sand resulting in more or less sand on the beach during any given season. We love our ever-changing natural beach and we hope you do too! Experience the Island way of life in a 3 bedroom 2 bath Cape Cod style beach house. Features include a bright open concept, fully equipped modern kitchen and dining area that seats 6 or more comfortably. Enjoy ocean views from almost every window. Off the kitchen is a screened-in sun porch with a comfortable sitting area where you can enjoy more of the amazing views while sipping on your morning coffee. Relax in and enjoy the cozy living room with comfy furniture for reading or watching your favorite show. There's tons of natural light, a gas fireplace for the cooler days and more beautiful water views from every window. There are two well-appointed bedrooms off the living room. Both are decorated with antique furnishings. A full bathroom with shower and tub (with spa toiletries) completes the downstairs. Complimentary WiFi, Satellite TV, Netflix, DVD player, a selection of DVD's, board games, puzzles and a selection of books for all ages. Included in your stay enjoy the use of bicylces, (bike helmets not provided) 3 kayaks, (life jackets and paddles provided) beach toys, horseshoe pits, lawn chairs, beach chairs and a gas barbecue. If you'd like to explore more of the Maritime"s the Northhumberland Bay Ferry to Nova Scotia is only 18 km from the beach house. During the summer months, reservations for the ferry are recommended. The beach house is also a short distance away from the Confederation Trail which is great for both cycling and hiking. If you prefer to just sit, unwind you can enjoy our cozy sitting area in our screened in gazebo. Then, as the day comes to a close, you can enjoy the spectacular sunsets, stargaze or enjoy a bonfire on the beach. For a real fresh PEI lobster experience you can purchase lobsters directly from the local wharf 15 minutes away between May and the end of June. Of course fresh lobster is still available outside the lobster season at various seafood markets. Steve and I are Maritimers at heart having lived on the East Coast most of our lives. Work took our family to Ottawa, the capital of Canada going on 12 years ago. Ottawa is beautiful, but the east coast will always be "home" Our dream: to one day move back to the East Coast but for now we are more than happy to share our little piece of PEI paradise with other families. We've always dreamed of buying an ocean front property and we had a mental picture of exactly what we were looking for. We finally found our dream cottage on PEI with the Bellmora Beach House. It was love at first sight, the unspoiled beauty was breathtaking from the beautiful red sand beach to the acres of groomed lawn and gardens. An added bonus for us was that we were able to carry on the 15 year legacy of providing vacation rental experiences started by the previous owner. Bellmora Beach House is a very unique property. You can feel the tranquility and magic from the moment you begin the drive down the long tree lined lane way. As you come to the end of the lane the view opens up to a wide breathtaking expanse of the 5 acre groomed property, where the beach house sits, a stone's throw away,. We will never forget our first coffee in the screened in porch overlooking the beach and neither will you! From inside the cottage and screened in porch enjoy the breathtaking views of the Northumberland Strait and the Pinette River. Linens included are new high quality comforters, bed sheets, pillows, pillow cases and bath towels, hand towels and faceclothes. Extra comforters provided if needed. Thanks for staying at Bellmora and enjoying Prince Edward Island. Beautiful setting; lovely house; excellent location from which to start our adventures each day. We looked forward to counting the herons at the water's edge each morning and then to sprawling out in homey comfort after our daily excursions. We are happy that Bellmora was part of your island adventures. Glad you had a great stay. Glad Pete, Jackson and yourself had a great time in PEI, and at Bellmora. Vacations are a time to relax and get re-invigorated. Really glad you were able to enjoy all the Bellmora and the local area have to offer. We also think it is a pretty special place. Hopefully we can have you visit Bellmora again in the future. We are really privileged to have such wonderful return guests. Every year we try we strive to make the experience more memorable. We look forward to having you again in the future. We enjoyed our stay at the Bellamora Beach house. Lovely waterfront home and the owners have thought of everything to add to your enjoyment including 3 kayaks, bikes and a horseshoe pit The yard is enormous with a screened in gazebo. We spent many hours there or in the screened in porch enjoying the amazing sunsets. Nice long beach to look for treasures and when the tide is low, you can walk forever. We also enjoyed the Point Prim Chowder House and Lighthouse, Charlottetown, Prince Edward Island National Park and the beach at Basin Head. The owners were especially responsive to questions or concerns. We hope to return!. . Shirley, we are really happy you enjoyed your stay at Bellmora. We truly have a desire to make your stay the best it can be. Glad you were able to explore the local sites and flavours, lots to explore in beautiful part of PEI. We would love to have you back. Property very nice and big dogs loved it. Everything you need is included. I will be back. So glad you and your family enjoyed your return visit to Bellmora! beautiful view of Orwell Cove. A must if you love to golf! Coopers General Store is a 10 minute drive from the beach house. . Coopers has it all and more, groceries, butcher, gas and liquor mart. One stop shopping with a friendly atmosphere! Wood Islands Seafood is a 15 minutes drive for all your fresh seafood, takeout restaurant on the side. Lady Slipper Cafe is a 15 minutes drive. Great menu, food is delicious with a fun atmosphere! Perfect for the whole family. Wheel Chair accessible Located at the Tourist Center., Wood Islands. There's so much more to do and see in our lovey area!